There will be only one (last) round of the Regular Season in D1. Here is the last round review presented by ESL. Top ranked Al Shamal (12-3) recorded its third loss in Doha on Saturday night. Hosts were defeated by fifth ranked Al Wakrah (9-6) 64-55. It ended at the same time the four-game winning streak of Al Shamal. They outrebounded Al Shamal 55-40 including 42 on the defensive glass. American power forward Joshua Caldwell (203-91, college: William Penn, agency: SDJ Sports) fired 17 points, 9 rebounds and 4 assists for the winners. The former international center Mame Souleye (206-87) chipped in 14 points and 15 rebounds. The former international power forward Emir Mujkic (210-97) produced 11 points and 9 rebounds for lost side. Al Wakrah moved-up to fourth place, which they share with Al Arabi. Al Shamal at the other side still keeps top position with three games lost. Al Wakrah is looking forward to face bottom-ranked Al Rayyan (#9) in Doha in the next round where they are favorite. Al Shamal's supporters also look forward to an exciting derby game next round, where their team will travel locally in Doha to the arena Al Sadd. Another interesting game was a derby match between two teams from Doha: Qatar Sports Club (#3) and Al Sadd (#2). Qatar Sports Club (12-4) won against visiting Al Sadd (11-4) 79-68. It was a key game for the second position in the league. Worth to mention a great performance of American guard Jeff Newberry (188-92, college: Oklahoma St.) who helped to win the game recording a double-double by scoring 29 points and 10 rebounds. Mohd-Yousuf Mohmmed contributed with 14 points, 9 rebounds and 5 assists for the winners. 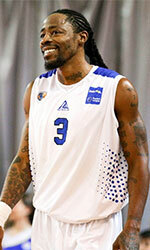 American point guard Dominic James (180-86, college: Marquette) replied with 25 points and 7 assists for Al Sadd. Qatar Sports Club moved-up to second place. Al Sadd at the other side dropped to the third position with four games lost. Qatar Sports Club's supporters look forward to another derby game next round, where their team will face at home their local rival from Doha . Another interesting game was again a derby between two local teams from Doha: Al Gharafa (#6) and Al Rayyan (#8). Al Rayyan was defeated at home 94-98 and even the fact of playing on their own court did not help. The game was dominated by American players. Worth to mention a great performance of Franklin Session who helped to win the game recording a triple-double by scoring 32 points, 17 rebounds and 10 assists. At the losing side Akeem Wright responded with 31 points, 6 rebounds and 6 assists. Al Gharafa maintains sixth position with 7-8 record. Loser Al Rayyan dropped to the bottom place with 13 games lost. They share the position with Al Khor. Al Gharafa's supporters look forward to another derby game next round, where their team will travel locally in Doha to the arena Al Ahli. Bottom-ranked Al Khor managed to get a second victory, breaking the nine-game losing streak. This time they won against seventh-ranked Al Ahli in Doha 96-86. The winners were led by Ameer Jackson who had that evening a double-double by scoring 39 points (!!! ), 15 rebounds and 6 assists. Al Khor (2-13) moved-up to eighth place, which they share with Al Rayyan. Al Ahli lost fourth consecutive game. They keep the seventh position with 11 games lost. Al Khor's next round opponent will be higher ranked Al Arabi (#4) in Doha and it may be quite challenging game. Top ranked Al Shamal (12-3) recorded its third loss in Doha on Saturday night. Hosts were defeated by fifth ranked Al Wakrah (9-6) 64-55. It ended at the same time the four-game winning streak of Al Shamal. They outrebounded Al Shamal 55-40 including 42 on the defensive glass. American power forward Joshua Caldwell (203-91, college: William Penn, agency: SDJ Sports) fired 17 points, 9 rebounds and 4 assists for the winners. The former international center Mame Souleye (206-87) chipped in a double-double by scoring 14 points and 15 rebounds. Caldwell is a former Eurobasket Summer League player, which is considered top international summer league in the market. Four Al Wakrah players scored in double figures. The former international power forward Emir Mujkic (210-97) produced 11 points and 9 rebounds and Egyptian guard Omar Salem (190) added 13 points and 7 rebounds respectively for lost side. Al Wakrah moved-up to fourth place, which they share with Al Arabi. Al Shamal at the other side still keeps top position with three games lost. Al Wakrah is looking forward to face bottom-ranked Al Rayyan (#9) in Doha in the next round where they are favorite. Al Shamal's supporters also look forward to an exciting derby game next round, where their team will travel locally in Doha to the arena Al Sadd. Another interesting game was a derby match between two teams from Doha: Qatar Sports Club (#3) and Al Sadd (#2). Qatar Sports Club (12-4) won against visiting Al Sadd (11-4) 79-68. It was a key game for the second position in the league. Worth to mention a great performance of American guard Jeff Newberry (188-92, college: Oklahoma St.) who helped to win the game recording a double-double by scoring 29 points and 10 rebounds. The former international center Mohd-Yousuf Mohmmed (204-82) contributed with 14 points, 9 rebounds and 5 assists for the winners. Four Qatar Sports Club players scored in double figures. American point guard Dominic James (180-86, college: Marquette) replied with 25 points and 7 assists and his fellow American import guard Russell Byrd (201-92, college: Michigan St.) added 16 points and 5 rebounds in the effort for Al Sadd. Qatar Sports Club moved-up to second place. Al Sadd at the other side dropped to the third position with four games lost. Qatar Sports Club's supporters look forward to another derby game next round, where their team will face at home their local rival from Doha . Bottom-ranked Al Khor managed to get a second victory, breaking the nine-game losing streak. This time they won against seventh-ranked Al Ahli in Doha 96-86. Al Khor forced 22 Al Ahli turnovers. 31 personal fouls committed by Al Ahli helped opponents get some easy free throw opportunities. The winners were led by American point guard Ameer Jackson (193-94, college: Winston Salem) who had that evening a double-double by scoring 39 points (!!! ), 15 rebounds and 6 assists and the other American import forward Da'Quan Cook (205-87, college: St.Bonaventure) supported him with 24 points and 5 rebounds. Even a double-double of 20 points and 17 rebounds by American power forward Kenny Hall (206-90, college: Tennessee) did not help to save the game for Al Ahli. Guamanian-American guard Earnest Ross (196-91, college: Missouri, agency: Haylett Sports) added 24 points, 9 rebounds, 6 assists and 4 steals for lost side. Both teams had four players each who scored in double figures. Al Khor (2-13) moved-up to eighth place, which they share with Al Rayyan. Al Ahli lost fourth consecutive game. They keep the seventh position with 11 games lost. Al Khor's next round opponent will be higher ranked Al Arabi (#4) in Doha and it may be quite challenging game. Another interesting game was again a derby between two local teams from Doha: Al Gharafa (#6) and Al Rayyan (#8). Al Rayyan was defeated at home 94-98 and even the fact of playing on their own court did not help. Al Gharafa looked well-organized offensively handing out 23 assists. The game was dominated by American players. Worth to mention a great performance of guard Franklin Session (187-89, college: CS Los Angeles) who helped to win the game recording a triple-double by scoring 32 points, 17 rebounds and 10 assists and forward Nick Stover (198-93, college: S.Alabama) who added 30 points and 11 rebounds during the contest. Worth to mention Stover played also at Eurobasket Summer League, which helped get the job in pro basketball. At the losing side swingman Akeem Wright (200-84, college: Kansas St., agency: Octagon Europe) responded with 31 points, 6 rebounds and 6 assists and guard Xavier Cannefax (188-89, college: Warner Pacific) scored 24 points. Both teams had four players each who scored in double figures. Al Gharafa maintains sixth position with 7-8 record. Loser Al Rayyan dropped to the bottom place with 13 games lost. They share the position with Al Khor. Al Gharafa's supporters look forward to another derby game next round, where their team will travel locally in Doha to the arena Al Ahli.